Congratulations to CloudPersona who won last night’s drawing! Only 9 months until the drawing! WHAT IS TAY GAME NIGHT!? But Aikage Senpai, Didn’t we/don’t we have game night already? uhhhhhhhh nope! Originally Neryl did it way back when, then she had some stuff happen and gave it up so I took it over and it was pretty good, then I weinered away to the lands of make believe and left it in DisturbedShadow’s capable hands and it died because the community went through a bit of a downturn. So Why Do You Think It Will Work Now? You Say You’re Going To Bribe Us? Of Course!! It’s the Furby way! So here’s how nouveau game night shall work. At the end of the night I draw a name from the people who attended. This person is entered into a yearly drawing for a 60$ Best Buy voucher! Since we’re starting in February your odds are even better! Wow! I Could Get A New Video Game With That! How Do I Attend? Great question hypothetical reader! For now, I will be doing game night ONCE a month. Previously we were up to twice a week. This was too much for me. If anyone wants to help out with hosting let me know. It’s a commitment so please don’t try to help if you aren’t willing to be at a game night once a month (so we could do game night twice a month). Something Something Cross Event Synergy...question? Why yes, of course I will also mention that our game nights will be streamed on the TAY Youtube channel. We will meet up in the TAY Discord for voice chat and organization! Also, whoever wins theTAY Photoshop contest will have their entry used as the TAY Game Night Header image for the following month! 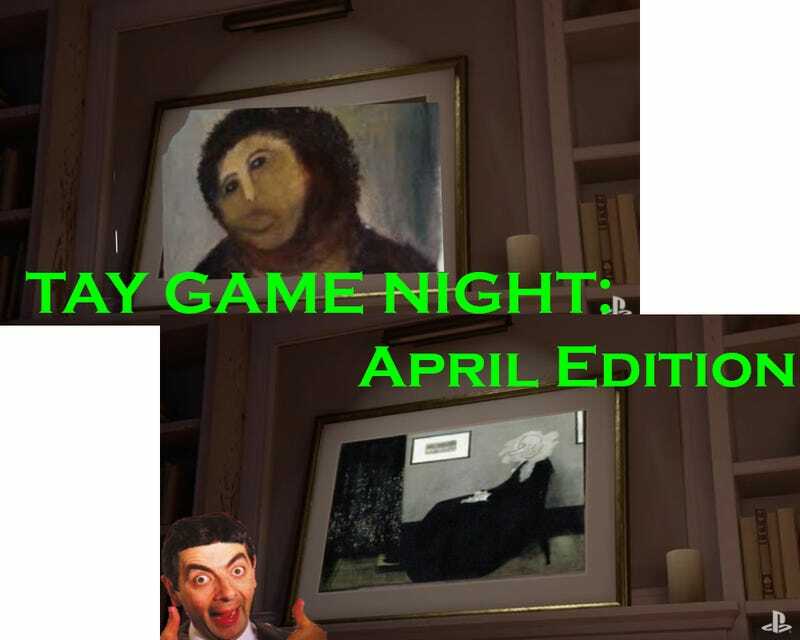 OK, So As Of Now, Game Night will be the LAST TUESDAY OF EVERY MONTH AT 8pm EST? That’s correct. Towards the end of the month I’ll get a post up asking you for game night suggestions for the following month. We can do PS4, PC, XBOX1, whatever system you want. I just did a fallback game for this month that I’m 90% sure you own and also will be accomodating if we have less people show up. If you’re not interested in hosting skip to the comments now! Don’t be afraid to Spam invites to everyone on Steam/Discord/PSN/XBL/etc. No one on TAY remembers anything. It’s group amnesia/alzheimers. I mean this. We all have problems. Send help. Don’t be discouraged if no one shows. This happens. It WILL happen. The more we have a consistent time and place, the more people will begin to remember and show up. Pick an older, cheap, fun game. Starcraft is 15$. I would consider that the upper range on price. However, everyone should go buy Starcraft now, because I’m telling you we’re going to have retro Starcraft night sometime. I’ve got more but I feel I’m going off track here. If you want to host a game night and you want to use this format and have people entered into the drawing/etc. contact me first. We can arrange something! Just be prepared to host! OK, I hope I’ve made things pretty clear, but if you’re still not sure of something, or you want to discuss, I’ll be around today and I’ll bump this once a week or so on various days.